Winemaker Kenny Likitprakong, a University of California at Davis graduate who has made wine under several labels (Hobo, Banyan Wines, Folk Machine), took over the farming of a 10-acre vineyard owned by the Woodruff Family consisting of 4.5 acres of Pinot Noir and 3.5 acres of Chardonnay. 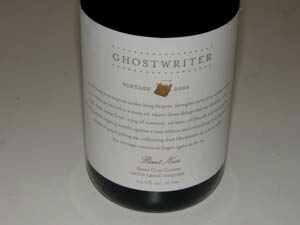 He crafts small lots of Pinot Noir and Chardonnay from this vineyard and Aptos Creek Vineyard, both in the Santa Cruz Mountains appellation under the Ghostwriter label. The wines are in limited production with some retail distribution.